Decompression Therapy is a non-surgical procedure that effectively treats disabling low back, neck, and radiating leg, & arm pain. 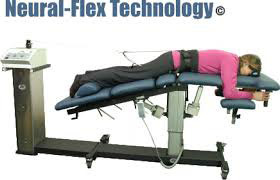 Decompression Therapy effectively relieves pain associated with disc herniation, degenerative discs, posterior facet syndromes, due to decompression of spinal discs and facet joints, that is, unloading due to distraction and positioning. Decompression Therapy effectively enhances the healing process and renders quick, effective and amazing pain relief that enables most patients to return to a more active lifestyle. Is Decompression Therapy right for you? Decompression Therapy is an effective treatment for patients suffering herniated or degenerated discs as well as posterior facet syndrome which respond well to the distraction. Certain conditions such as fractures, gross osteoporosis, and tumors are not candidates for this treatment. 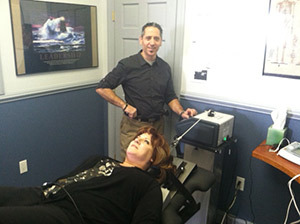 Decompression Therapy begins with a series of sessions typically 3 times per week. Each session is approximately 8 – 12 minutes. Following each session, electrical muscle stimulation is applied to help relax your muscles and ligaments. After treatment, your doctor may prescribe specific exercises designed to help you regain control and strengthen the co-contractor muscles which are responsible for stabilization. Decompression Therapy is administered to patients fully clothed either face down or face up on the table. Clinical studies suggest Spinal Decompression Therapy provides a majority of qualified candidates with initial relief within a few sessions. Maximum benefit is usually achieved within 8-15 sessions. Decompression Therapy is an approved procedure that is covered by most insurance companies, and is compensated under Act 57 (PA Workers Compensation) and Act 6 (PA Personal Injury). For more information please contact Adelphia Chiropractic Health today to make an appointment. “I injured my low back working for the water company. After months of failed treatment, I was told surgery would be my next step. One week before my surgery, I saw an ad for decompression therapy and decided to give it a try. I was skeptical at first considering that the physical therapy I was prescribed had utterly failed. Surprisingly, after my very first decompression therapy treatment I felt 80% better! Now after undergoing three weeks of treatment I have almost no pain at all and can function normally again. Anyone considering surgery should try this first! “For years I have been suffering from cervicogenic headaches. Nothing I tried worked. A friend told me about a new treatment called decompression therapy. Wow ! What a difference. I have been headache free ever since. Please, if you are suffering as I did, give this a try.